Re-Logic's wonderful side-scroller Terraria comes to consoles with superb gamepad controls and streamlined multiplayer integration. The nicest thing that one can say about the newly released console version of Re-Logic’s Terraria is that it is a perfect reproduction of the PC game. One might even say that it is an improvement on Andrew “Re-Digit” Spinks’ work. Publisher 505 Games chose wisely in pairing a consulting Re-Digit with developer Engine Software; the studio took the great work that resulted in the PC game and molded a console-friendly take out of it. The gamepad integration alone is revelatory, streamlining out much of the inherent clunkiness that comes from a standard mouse/keyboard interface on PC. Terraria is a difficult game to encapsulate. You really just have to sit down and play the thing, then wait for the light bulb to flicker on over your head. On the surface it appears to be a 2D take on Minecraft, with resource gathering and block placement tools that mirror Mojang’s voxel-based 3D worlds. That comparison only goes so far, however; while you certainly can build elaborate structures in Terraria, the actual flow of the game is built around exploration and character progression. You’ll dig deep and build high, but it’s always in the service of powering yourself up in the side-scrolling world. 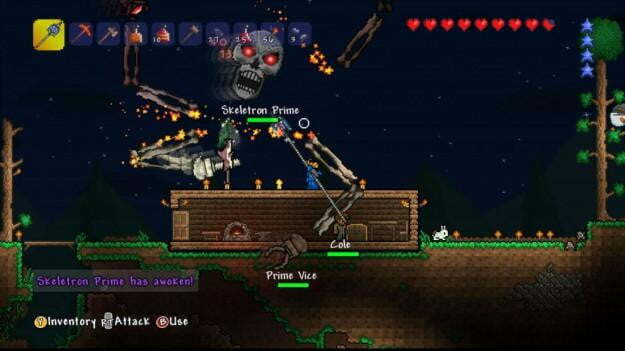 Newcomers can feel their way through the world, or they can turn to the rich resource that is the Internet – particularly the Terraria Wiki – for a rundown of how to best get started. Engine Software adds a fleshed out tutorial mode for the console release, much like 4J Studios did for its own console port of Mojang’s hit. 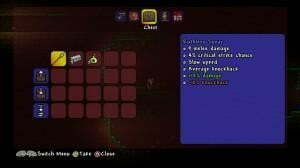 The tutorial is useful for getting the knack of Terraria‘s unique gamepad controls, though it also lays out the basic “getting started” rules that one would normally seek out on the Wiki. You’ll learn things like the importance of building a residence for the Guide, and for the others that come to populate your world over time. The tutorial also lays out the basics of resource gathering and crafting, the latter of which is built around a new, gamepad-accessible interface. You can’t set an offline game to pause while you’re in the crafting menu as you can on the PC, but the basic functionality of the original game is realized well in this port. As mentioned above, gamepad support is generally just a great addition to Terraria. The left thumbstick handles all movement while the right thumbstick is used to direct the course of your digging, mining, chopping, and attacking. The default automatgic mode is perfect for relatively quick traversal; simply nudge the right stick in the direction that you want to be digging and hold down the right trigger (once the appropriate tool is equipped) to carve away the blocks in your chosen direction. Manual mode is accessed with a click of the right stick. Once activated, the automatic mode indicator is replaced by a small, white set of crosshairs that you can move freely in a small circle around your character. This indicates the range of your mining/digging/chopping/block placement. 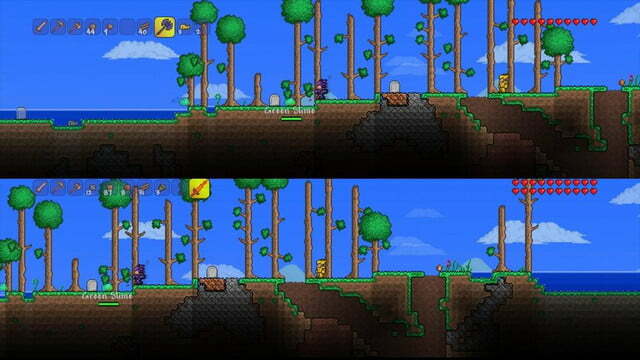 Manual mode is a necessary complement to automatic; you’ll need to use both in order to succeed in Terraria. While auto is best for carving a path through the environment, manual is what you’ll use when you find a vein of ore or start building structures. Terraria‘s console release also adds some new content, most notably an added final boss in the Hardmode endgame. This content slides in seamlessly; it is, effectively, just “more Terraria.” That isn’t a bad thing at all. Serious fans will pick up on the new bits, but newcomers and casual fans won’t even notice. They simply have a slightly deeper game to explore. Terraria is built around the magic of discovery. It’s more than just the simple joys of finding a Heart Crystal or hidden treasure room deep underground. This is a game of epiphany moments. An experience where, after throwing yourself at the Eye of Cthulhu boss multiple times, you suddenly realize that you can pillar up into the sky and use all of those stone and dirt blocks you’ve gathered to create a dedicated, enclosed battle arena. That this magic translates so well on the console side is a commendable achievement, and one that Engine can be proud of. 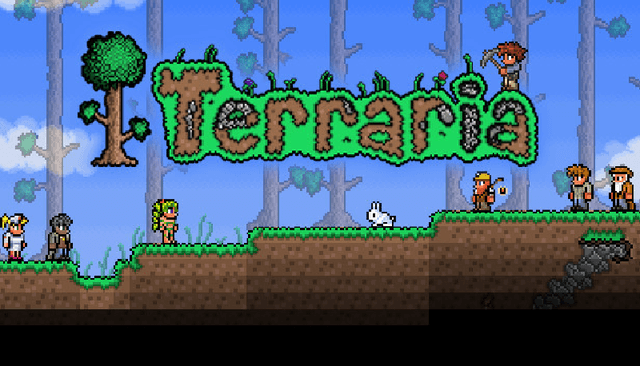 Terraria is a game for everyone. If you’ve played it on PC, know that you’ve got some new toys and a fresh take on the control scheme waiting on consoles, not to mention a much-simplified multiplayer connection process. If you’re a first-timer, all you really need to know is that the game lifts the best bits of Minecraft and the RPG-focused qualities of Zelda II: The Adventure of Link to deliver an experience that is part-open world exploration, part-RPG, part-old school arcade action, and all fun.